CNS Canada –– Global supply-demand outlooks, released by the market monitoring agency of an alliance of 11 international organizations, point to lower corn production for 2018-19. 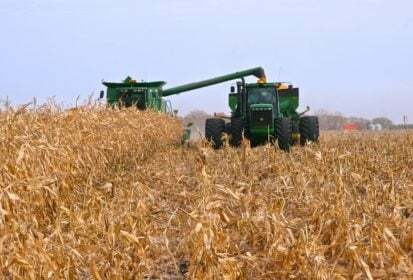 The Agricultural Market Information System (AMIS) Market Monitor report for July said the record corn harvest in 2017-18 will slip by more than four per cent in 2018-19. That’s due mostly to smaller harvests in Brazil, Argentina and the U.S.
Corn production is estimated at 1.045 billion tonnes for 2018-19, down from June’s estimate of 1.047 billion and from last year’s 1.091 billion tonnes. The U.S. Department of Agriculture has estimated corn production at 1.052 billion tonnes for 2018-19. Wheat production is also forecast to fall in 2018-19, mostly because of declines in China, the European Union, Russia and Ukraine. AMIS forecasts 2018-19 production to come in at 736.1 million tonnes, compared to 756.8 million in 2017-18. Soybean production is virtually unchanged in the July report, which confirms a strong year-over-year increase in production from Argentina, Paraguay and Uruguay. AMIS forecasts soybean production for the 2018-19 crop year at 359.6 million tonnes, compared to 358.3 million tonnes last month, and 337.9 million tonnes in 2017-18. The report also trimmed wheat stocks significantly from its June report to 264.2 million tonnes from 283.4 million. Corn stocks are trimmed slightly to 260.3 million tonnes from 262.4 million in June. That would put ending stocks for 2019 at the lowest levels in five years. Last year they were 309.9 million tonnes. Soybean ending stock forecasts for 2018-19 are raised to 39.2 million tonnes, from 36.7 million tonnes in June. That compares favourably to 2017-18 ending stocks of 39.5 million tonnes. The report also cautioned that trade tensions between the U.S. and China, which have already roiled soybean and soymeal prices, will continue to have strong spillover effects on all oilseeds. The AMIS report is a collective analysis of its member organizations: the United Nations Food and Agriculture Organization, the International Fund for Agricultural Development, the International Food Policy Research Institute, the International Grains Council, the Organization for Economic Co-operation and Development, the UN Conference on Trade and Development, the World Bank Group, the World Food Programme, the World Trade Organization, and Global Agricultural Monitoring.